Fascinating cinematic tragicomedy mining the facts of Soviet playwright Mikhail Bulgakov’s commission to write a play about his arch-enemy Stalin. Although satirist Mikhail Bulgakov was most likely the leading Soviet playwright, he is best known in the United States for his novel The Master and Margarita, published three decades after his death. 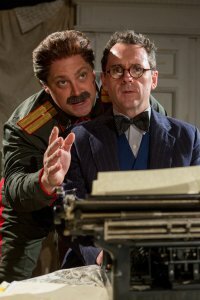 John Hodge, Danny Boyle’s favorite screenwriter with six collaborations so far, has fashioned a mordantly satiric tragicomedy, Collaborators, a fantasy using biographical facts which describe not only the last years of Bulgakov’s working life but encompass a scathing indictment of life under Soviet rule. Peter Dobbins’ production, the first for The Storm Theatre at Grand Hall of St. Mary’s Church, is a sharp, clever look at a genius under a totalitarian regime, brilliantly acted by a large cast of character actors. The production is the North American premiere of London’s 2012 Olivier Award winner for Best New Play. The facts are these: Bulgakov was Stalin’s favorite playwright, and the leader saw Bulgakov’s The Days of the Turbins between 15 and 20 times. However, by 1929 Bulgakov plays could no longer be staged or published due to government censorship. However, it is well know that when Bulgakov in despair sent Stalin a letter asking to leave the country, Stalin personally called him on the telephone and subsequently obtained a job for him at the Moscow Art Theater. The 1936 MAT production of Bulgakov’s subversive Moliere, in which a playwright is a “thorn in the flesh of an oppressive regime,” was canceled soon after the opening night. Bulgakov was commissioned to write a play about the early life of Stalin to be ready for the celebrations for the leader’s 60th birthday in 1939. Although he completed this hackwork which he entitled Batun (named after the town where Stalin spent his young adulthood), it was accepted but never performed. And Stalin really did have a secret office bunker reached through one of Moscow’s subway stations. Hodge has written Collaborators in the sardonic style of Bulgakov’s own plays particularly the 1926 Zoya’s Apartment which was given its Broadway premiere at Circle in the Square in 1990. Just before the opening night of his biographical play Moliere, Bulgakov again has his recurring dream in which he is chased around the room by Stalin. Bulgakov wakes up to the realities of his life: sharing a two-room collective apartment with ex-aristo Vassily, history teacher Praskovya, and new tenant, steel worker Sergei, a devoted party member who lives in their cupboard. The morning after the opening night of his Moliere at the Moscow Art Theater, he is visited by Vladimir and Stepan, two secret police from the NKVD, who inform Bulgakov that the play has been canceled giving him a gap in his schedule which will give him time to work on a commission he can’t refuse: a play on the early life of Stalin to be ready in four weeks as a birthday present for the leader. At first, Bulgakov refuses, but realizes he has no choice if he is to safeguard the life of his wife Yelena and himself. He is given an office in secret police headquarters but has no pages to submit to Vladimir. One night, he receives a phone call from Stalin and told to meet him in the secret bunker in the subway station. Stalin treats him like a long lost friend and offers to collaborate with him on the play which has apparently not been kept a secret. When Bulgakov claims not to be able to identify with the material, Stalin offers to write it for him – if Bulgakov will do his work making decisions on government projects. While Bulgakov meets with Stalin at night, Vladimir, who has appointed himself producer/director of the play, rehearses the scenes by day. However, this happy state of affairs is not to last long as Bulgakov’s governmental decisions begin to backfire at the same time his personal luxuries begin to increase. The fact that the play started as a screenplay is obvious in the many short scenes which alternate between Bulgakov’s collective apartment, the rooms in which he writes, his doctor’s office, a dungeon at the Lubyanka Prison, and the rehearsal room at the Moscow Art Theater. Dobbins’ production is best in its use of the space for the quick transitions between scenes of which there are about 25 in the first act alone. However, the style of the performance is a little too literal for its surrealistic carnival-type atmosphere, the colorful cast of characters as well as the seemingly caustic satire of life in Soviet which is mostly historic. However, the play’s theme that the support of the intellectuals made the Soviet purges possible is much in evidence by the play’s ironic ending. That the 12 actors play 25 roles and keep them very much differentiated is a credit to both director and cast. Best is Ross DeGraw as an expansive, exuberant Joseph Stalin, whose big humorous performance keeps us from noticing what a monster he will turn into. As Bulgakov, Brian J. Carter is wry, serious, principled and continually perplexed by the quandary he finds himself in. As the other tenants of the collective apartment, Edward Prostak as the representative of the old regime and Jessica Levesque as the pessimistic teacher are amusing in their cynicism. Playing Bulgakov’s worried wife Yelena, Erin Biernard is sweet and supportive but the play does not give her much to do. Robin Haynes as secret policeman Vladimir with other ambitions is another comic creation. Sean Cleary is heroic as Young Joseph in the scenes from “Bulgakov’s play” about Stalin. Both the atmospheric scenic design by Rebecca Grazi and the period costumes by Courtney Irizarry often incorporate the ironic use of the color red. Joel Abbott’s sound design makes good use of Russian music both martial and choral to help set the scene. 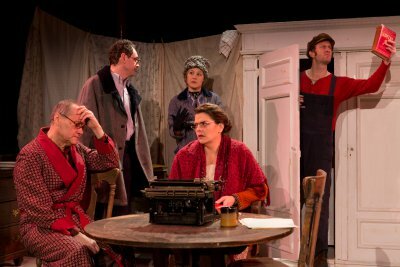 John Hodge’s Collaborators is a fascinating new window on life in Soviet Russia as well as a fine introduction for most theatergoers into the work of the great writer Mikhail Bulgakov. It will make you want to read some of his own plays or novels which were too censorious and trenchant in their irony to be acceptable to the Soviet regime in their own time. A feisty journalism intern uncovers long hidden secrets among small town friends in this earnest and well acted but unsatisfying new play. Watching three real-life characters put through the melodramatic ringer in Jonathan Leaf’s new play has its fascination. A well presented but deficiently conceived performance piece depicting the horrors of W.W. I based on the writings of Siegfried Sassoon and Wilfred Owen. A fiery con man intrudes into the lives of a farm family with a spinster in this tender revival of N. Richard Nash’s lovely piece of 1930’s Americana. Two rare French one-act comedies, both with endings that are divinely inspired, comprise a new double bill.